Tournament top seed Ivan Ljubicic of Croatia had to pull out all the stops against Algerian qualifier Lamine Ouahab -- ranked in singles far below him at 318 -- before battling to a three-set 6-4 4-6 6-3 win. 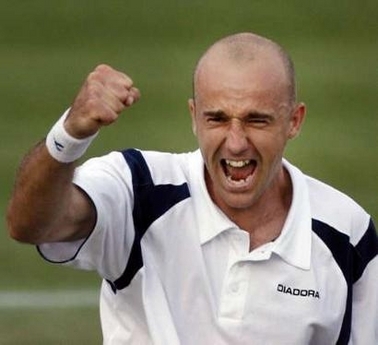 On a day when South African players had mixed fortunes -- three defeats and two victories -- Ljubicic, ranked 22 in the world, struggled to subdue an opponent full of fight, fine passing shots and great retrieving. To be fair, the wind, as Rik de Voest predicted it might be, was a leveller, making life difficult as it swirled around the sparsely populated centre court. Yet Ljubicic was not the player he was in 2006, when he was ranked third in the world. He made several unforced errors and allowed the qualifier to rattle him, catching him out of position on several occasions. However, like all great players, when Ljubicic really needed it he was able to raise his level and, especially in the final four games of the last set, started to dominate his young opponent. "It was very difficult," he said after the match. "I didn't know what to expect. He had probably seen me play but I had never seen him. Basically, I had everything to lose and he had everything to gain so he went for his shots. His return of serve was very good. "But I was happy, considering the conditions, with the way I played. The wind was swirling and difficult to judge but my serve was solid. "It's not easy to play as top seed but when it came down to winning or losing the match I at least had the greater experience and I think that counted." The day started well for SA when De Voest, ranked fifth in this tournament, held off an onslaught from the 2m Daniel Brands, to win 7-6 7-6. He won the tiebreakers 7-4 and 8-6. Brands tried to overwhelm De Voest with his power but the South African remained calm and out-thought the German with his superior court craft. Brands made several unforced errors against a De Voest who has shown remarkable improvement during the past three years. "I started working with an American coach, Scott McCain, during Wimbledon and changed my racquet. This helped a lot with a sore shoulder that bothered me when I served," De Voest said. "I found it very difficult to find my rhythm in the match because of his style of play and the weather, but I think my superior court craft was a key factor. He also failed to make shots at crucial times," he said. De Voest revealed that his success in the tiebreakers was due to his wife Carolyn: "She calls me king of the tiebreaks. She is a life coach and is mad about sport. She has had a big effect on me." Other South African winners were Izak van der Merwe, who beat Ukranian Denys Molchanov 7-6 (7-2) 7-5, and Kevin Anderson, who beat Filip Prpic of Sweden 6-2 6-2. Losers were Wesley Moodie, who lost 1-6 4-6 to Spain's Adrian Menendez, Ruan Roelofse, who lost 4-6 6-4 4-6 to Jeremy Chardy of France, and Heinrich Heyl, who was blown away 1-6 1-6 by Marcus Sarstrand of Sweden.